Objective. When planning surgery in patients with rotator cuff tear, strength of bone at the tendon insertion and trabecular bone structure in the greater tuberosity are usually taken into consideration. We investigated radiographic changes in bone structure of the greater tuberosity in rotator cuff tears. Design. Twenty-two human cadaveric shoulders from subjects ranging from 55 to 75 years of age were obtained. The integrity of the rotator cuff was examined by sonography to determine if it is intact without any tear, or torn partially or completely. The humeral head was sectioned in 3 mm thick coronal slab sections and microradiographed. 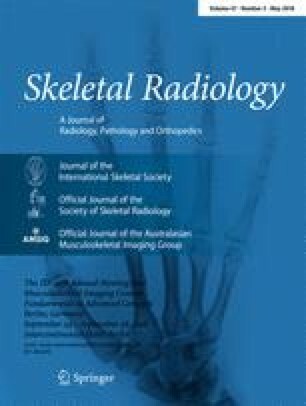 After digitization of the microradiographs and imaging processing with in-house semi-automated image processing software tools developed using software interfaces on a Sun workstation, the trabecular histomorphometrical structural parameters and connectivity in the greater tuberosity were quantified. The degenerative changes on the surface of the greater tuberosity were interpreted blindly by 2 independent readers. Results. Among the 22 shoulder specimens, the rotator cuff was found intact in 10 shoulders, partially in 7 and fully torn in 5. Statistically significant loss in apparent trabecular bone volume fraction, number of trabecular nodes, and number of trabecular branches, and a statistically significant increase in apparent trabecular separation and number of trabecular free ends were found in the greater tuberosity of the shoulders with tears. The loss was greater in association with full tear than in partial tear. Thickening of the cortical margin of the enthesis, irregularity of its surface, and calcification beyond the tidemark were observed in 2 (20%) shoulders with intact rotator cuff, in 6 (86%) shoulders with partial tear, and in 5 (100%) shoulders with full tear. Conclusions. Rotator cuff tears are associated with degenerative changes on the bone surface and with disuse osteopenia of the greater tuberosity. Aging, degenerative enthesopathy of the supraspinatus tendon, and rotator cuff tears appear closely related.